When our family gathers together, we have so many different diets and eating preferences represented. Typically, I do not cater specifically to all the varying tastes, but when there’s a recipe liked Mashed Cauliflower that pleases both the low carb, high protein people, as well as giving the rest of us our five veggies a day goal, it’s the best of both worlds. Learning how to cook cauliflower is something I wanted my children to learn, and that goal has been accomplished. I love a simple steamed cauliflower, which next to raw (with ranch dip, of course), provides the highest amount of nutrients. You may chop the florets large or small. The smaller the floret, the quicker they’ll quick, which will result in greater nutritional content. In order to steam them, pour one inch of water into saucepan, and then place the cauliflower in water, stem side down; cover. (If you have a steamer, place the steamer in the water, and put cauliflower on top.) Bring to a boil over high heat; reduce heat to low. Simmer around ten minutes until crisp-tender and drain. A fork should be able to pierce the florets. Add seasoned salt, cheese, or sauce, depending on the nutritional goal. Considering that my sister in love and I split this huge box of discounted cauliflower, you can be assured that I played with many recipes for cauliflower. Since Gourmet Mashed Potatoes are one of my favorite recipes, I was definitely going to attempt to recreate a no-carb substitute. This Mashed Cauliflower recipe is an amazing alternative to potatoes. Even if you don’t like cauliflower, give this a try. My kids gobbled it up, and I actually made a batch with FOUR heads of cauliflower and it was gone! Just like there are various mashed potato recipes, the same is true for this. Depending on if you want it low fat, in addition to being low carb, you will vary what you put in it. I have used low fat sour cream in lieu of cream cheese, and I have also put in both for a super creamy taste. Have fun with this and make it your own. Steam the cauliflower per directions above or according to the package directions, and place in large bowl. Add the cream cheese and butter. Let sit for a minute until softened. Add cream (or milk for lower fat content) and mashed until desired consistency is reached. Add seasonings and serve. I actually used a fork to mash the cauliflower in the above picture (thus, the chunkier texture), but you may also use a hand held mixer or food processor to mix until smooth. Trust me. Once you have tried this mashed cauliflower recipe, it will be a wonderful option to get those extra servings of vegetables in each day. I really need to get more veggies into myself and my kids so I will definitely be trying this recipe! 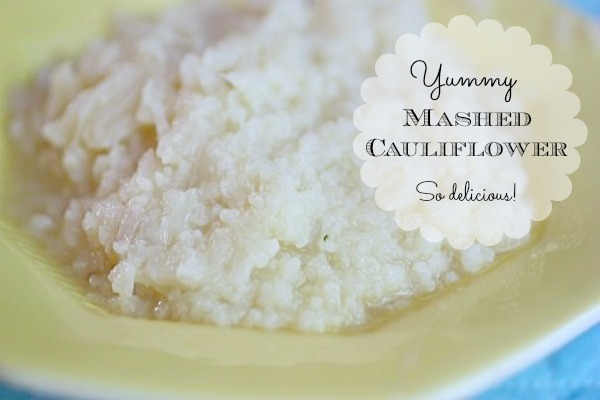 I love raw cauliflower, but do not really like it cooked – but this sounds yummy! Oh I love cauliflower, but maybe this would help my family learn to love it too! Yum Jen. I am envious of your cauliflower stash. Did you end up freezing any? I can only imagine you guys used four heads, we split one and there are only two of us. @Jens, It wouldn’t be right if the chickens didn’t also win some of the bounty. That’s what I call being thrifty! I need to try this. I have just recently convinced my kids to try roasted cauliflower. It takes on almost a hash brown flavor when it gets crispy in the oven. This looks SO yummy! Even at 7am! We love mashed cauliflower. Well, by we I mean me and my husband. My son likes his cauliflower just plain and raw. 🙂 I wish I had someone to split a bit ole case with me! I’d be in cauliflower heave. Real quick, I found a typo. the quick they’ll quick? The smaller the floret, the quick they’ll quick, which will result in greater nutritional content. This was great… so easy and you can improvise any ingredients you want.. Thanks for sharing! Love mashed cauliflower! Such a great side!